As sales triple year-over-year and a new cable communication standard arrives on the scene at the same time, a new-and-improved Apple TV could become the center of your digital home, according to a Wall Street analyst. "We [at Bernstein] believe the device has the potential to become a major product line," Sacconaghi writes. "In our view, Apple TV could relatively easily evolve into a full-featured digital media hub that can access not only iTunes and personally generated media content but cable TV as well." That could bring Jobs' vision for the device closer to reality. At the official release in 2007, Jobs described the Apple TV as a potential "fourth leg" for Apple's business where the Mac, iPod and iPhone make up the other three supports. Most people who use DVRs with digital cable must rent the box from the cable company in order to do so, or subscribe to services like TiVo. But new emerging standards could open up the market to products like Apple TV, according to Sacconaghi. He adds that new software standard called Tru2way might help Apple in this regard. It eliminates the need for special tuning cards and allows two-way communication from the user's box to the cable system, making services like video on demand and interactive programming guides a real possibility. 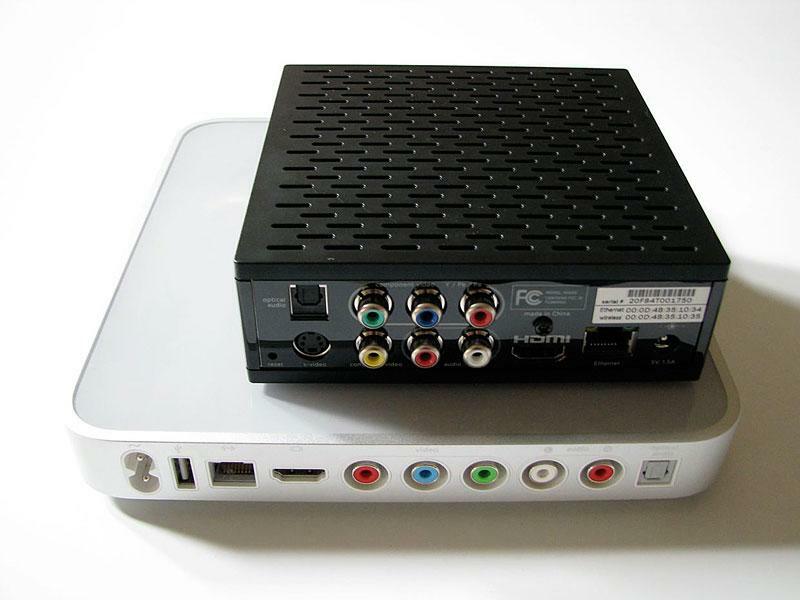 Third-party manufacturers can use the Tru2way technology to build their own devices with their own features, creating a new market where customers can choose a set-top box for use with their existing cable service. Apple, Sacconaghi says, is "uniquely positioned" to deliver a compelling device given its experience in hardware and software integration, intuitive user interfaces, and a large installed base of iPod/iTunes users, not to mention the foundation that already exists in the Apple TV. If the Intel-powered media hub is eventually made to access cable content and act as a DVR, Sacconaghi sees a widely-expanded market for the device than the estimated one million or so units already sold. "Given roughly 65 million cable TV households in the US, capturing a modest 10% penetration in two years would lead to cumulative Apple TV units of 6.5 million —or more than 6x the sales rate seen so far," he explains. "Assuming an average sale price of $300 per unit... given the increased functionality, the product could contribute roughly $1 billion in hardware revenues per year." Additionally, the analyst predicts, the new machine would drive adoption of other Apple products like Macs, iPods, and iPhones, giving customers seamless integration of their content whenever and wherever they choose, with the Apple TV serving as the media server at the center of it all. Apple TV and its Netflix-capable rival from Roku. Elsewhere, BusinessWeek's Arik Hesseldahl suggests Apple could follow the iPhone model and open up the Apple TV platform to third-party applications which users could download and install, enabling integration with online services like Hulu, Joost, CBS, and any other features Apple doesn't provide itself. Hesseldahl argues Apple should foster the same flexibility that helped the iPod take off, allowing users to bring together a variety of file formats since relatively small portions of most libraries are actually purchased from iTunes. Applied to the Apple TV, users could bring the videos they already own into the unit; however, whether or not customers would be able to digitize or even play DVDs is still a legal gray area and frequently opposed by movie studios. Apple introduced the Apple TV primarily as an easy way to wirelessly play iTunes content, including movies, TV shows, music, photos and podcasts, on a widescreen TV at Macworld 2007. Apple later added YouTube functionality that June. Since then, updates have been slow. It wasn't until Macworld 2008 when a new software update accompanied a price drop to $229 for the 40GB model, while users could also quadruple their storage with the 160GB unit for another $100. Dubbed Take 2 and available free to existing Apple TV owners, the new software added the ability to rent movies from the iTunes Store directly from the device, including HD video and, later, HD television shows. Apple has added Flickr and Mobile Me photo gallery integration since the original release, but Macworld 2009 was the first in three years not to see any updates concerning the Apple TV.